Craig speaking on Technology’s Impact on Music History at Le Chapelle Historique du Bon Pasteur, Montreal. These fun and enducational events are available as single lectures or a series for your social group or organization. They are illustrated with recordings, videos, and live music examples. The many satisfied clients include : Le Salon de Guitare (Montreal Jazz Festival), The Montreal Museum of Fine Arts, the McGill Centre For Continuing Education, Chapters bookstore, the McGill Young Alumni Association, the Beth Ora Seniors, the Beaconsfield Library, the Cote St. Luc Library, the Dorval Library, the Cummings Jewish Center, Le Phonotheque Quebecoise, and the Montreal Jazz Society. Radio versions were presented on CBC radio over a two year period. Email here for fees and availability. 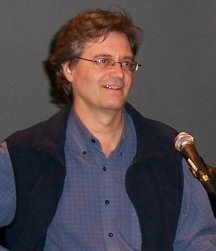 Morrison’s lectures and courses have been profiled many times in the Montreal Gazette and other publications. In 1993 he was awarded The Distinguished Teaching Award from the McGill Centre For Continuing Education. "Morrison, noted Montreal musicologist and swell musician, has been teaching everything from the blues to the Beatles for the last 15 years at McGill and Concordia universities as well as more offbeat learning centres like Zeke’s [Gallery]. 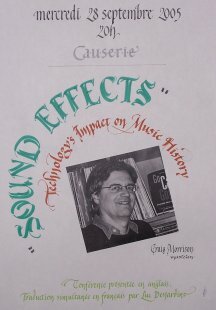 Morrison not only imparts knowledge on legends...but also plays the classics for his students." - Let’s Spend the Night Together in Stones Class by Bill Brownstein, Montreal Gazette, November 9, 2002. Poster for the technology lecture (sponsored by the Phonotheque Quebecoise). At the talk on George Gershwin’s Life And Times, at the Beth Ora Synagogue, Ville St. Laurent. 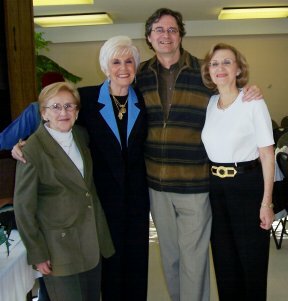 From left : Min Kofman, Mary Boeko, Craig, Mignonne Klein.